Editor's note: David Gergen is a senior political analyst for CNN and has been an adviser to four presidents. He is a professor of public service and director of the Center for Public Leadership at Harvard University's Kennedy School of Government. Follow him onTwitter. Michael Zuckerman is his research assistant. 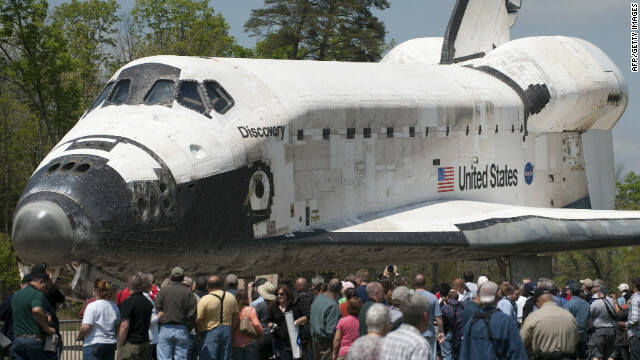 (CNN) - Space Shuttle Discovery started out as a way to discover what lies beyond us. Its last flight, taken earlier this week, helped to discover what now lies within us. Piggybacked atop a specially outfitted 747, Discovery made its flyover Tuesday above Washington - soaring over the White House and the Capitol, the Washington Monument and Arlington National Cemetery - en route to Dulles Airport and its new (and final) home, the National Air and Space Museum's Udvar-Hazy Center. All around Washington, people climbed up on rooftops, pulled off to the side of the road or gathered anywhere with a clear view to watch the shuttle's parting journey. The Washington Post reported tens of thousands on the Mall alone. You have money for shuttles but can't spare a little more money to protect Israel?? What stupid Americans seem not to understand, is that Jews are chosen people. We will reap the rewards of our faithful service to Yahweh. The goyim of this world should be happy to fight over the scraps that we Jews throw from table. Israel will reign supreme over earth, and anybody challenging that assertion will be conquered, with the help of US military. You people may not like us Jews, but you WILL learn to fear us. If a few of you must die to save a few of us....that's a bargain I can live with. Your own nations agree with me on this. Your sacrafices are necessary to ensure the survival of the only democracy in the middle east. Be happy. Having watched the IMAX "The dream is alive " many years ago with my then ten year old at the Smithsonian, we both now agree... "The dream has gone ...." at least for America. Somehow our values have changed.